First things first: I’m glad many of you like the idea of a Blogger Birthday Calendar! Just so I can work on it [further, that is, as I already got started] please let me know your birth date in the comments of yesterday’s post if you’d like to be included. What’s not to like about birthday wishes from all over the [blog] world?! Let’s talked [confusing] defintions! In case you’re really busy and just want to see the recipe you’re excused to skip to the bottom of this post right away. If, like me, you enjoy some random musings in a recipe post join me in my ponderings. The next definition confusion: Know that when I’ using the term ‘fusion cuisine’ I actually have no idea what the exact definition is. Usually being Miss proof-read-and-check-everything-twice when it comes to work I’m letting loose of my need to control everything on the blog. That being said my definition of fusion cuisine is met by just combining elements of different styles of cooking. Mashed potatoes [Kartoffelpüree] are typically German to me, the spices in the kidney bean part are Indian-inspired – ergo: fusing two cuisines. Simple. Wrong or right? Feel free to let me know if you’re familiar with these terms. Heat the oil in a saucepan and sauté the onion until translucent. sprinkle in the spices. Turn the heat down to medium and carefully toast the spices for about two minutes. Don’t walk away or you might burn them. Mix in the kidney beans and sauté for about two to three minutes. Add the passata and let simmer for five more minutes. Lightly mash some of the kidney beans to create a creamier texture. Layer the kidney bean sauce into a small casserole dish. Add the mushrooms on top if using. Add parnsips and Brussels sprouts to a small pot and add just enough water to cover them. Cook until tender. Pour in almond milk and blend [I used an immersion blender] until not completely smooth but leaving parts of the Brussels sprouts whole. Season to taste with garlic and onion powder*, salt and pepper. Spoon the mashed parsnips on top of the kidney bean mixture. Smoothen out the top. Bake the covered casserole in the preheated oven [375°F] for 20-25 minutes. *I find tastes vary hugely so my advice would be to start by adding just a sprinkle of garlic powder and 1/4 tsp of onion powder for a start. Then season to taste. Seeing this as a spin on the classic American pot pie I noticed just now that I’m writing this post that I actually fused three cuisines. An American/German/Indian fusion dish? Should we call it a multicultural taste experience?! I’ll let Laura and Kierston – as well as you – be the judges :). I’m also linking up with Healthy Vegan Friday for the first time. Happiness inducing today: Many wonderful happening that almost made me forget today (Friday) [or todmorrow – depening on what time you’re reading this] is my last day at the newspaper. Have you ever fused two cuisines? Which ones and how? Are you a fact-checker or relaxed about terms, definitions and spelling? I’m usually really finicky about it and my colleagues and family are simultaneously glad and scared when asking me to proof-read any texts they’ve written. Knowing I’ll be deeply honest and hard in my criticism. 1. Were you confused by the years celebrated on a certain birthday as a child, too? I remember explaining to a friend in 7th grade that your – just taking this as an example as it fits – 23rd birthday actually meant celebrating the end of your 23rd year and start of the 24th. Meaning that wishing somebody a happy 23rd year of life on their 23rd birthday was a little late. She was confused ;). 2. The birthday wishes made me think that a blogger birthday calendar might be a good idea. As much as I wish I did I don’t know every single blends or other blogger’s birthdays and would be glad to find out so I can return the well wishes. … and yes, I could totally see myself use that very printable to write them down :). So cute! 3. No matter how much I love my family some of their habits get annoying after a while. Call it OCD but doesn’t everybody know how to load a dishwasher the right way? There clearly is one best and most effective way ensuring all dishes get clean and reducing the time needed for unloading. Why, yes, I do have a system. 4. Long legs, a huge chest and barely weighing a gram too much: no, that’s not the description of a model. Far from it. What is is: spiders. That’s the downside of living in a countryside house: those ‘Weberknechte’ are everywhere.. The worst is when they decide to join you in the shower cabin allured by the steamy hot water. The horror. Forget the scary movies – this is enough for me already. 5. Finally word is spread of the amazingness of phyllo dough – obviously just because I started it ;). And can I just say how perfect the title of this post is? If you’re still not convinced you need some buttery hugs in your life then I’m at a loss. 7. Dear winter, I’d call you beautiful – okay, I do – if only you weren’t so damn cold. But yes, still beautiful with the thick snow blanket covering the surroundings. 8. Speaking of the cold: Can we talk about a current blessing and downfall of mine? Built-in seat heating. A blessing because – let’s face it – some mornings nothing else will get me out of my warm bed than the promise of at least staying semi-warm during my commute to work. The downfall? Confusing the car with said bed. Does anybody else get all dozy when cranking the heat up all the way in the car? I need to really focus and let down the car windows for the freezing 5 °F wind chill to wake me up again. Woops. 9. Another blessing – and this time without any downsides: my new thermos. You’ve heard me talk about my need for warm lunches before and this one’s absolutely perfect to ensure those at the office. Best investment recently. 10. Tomorrow’s the last day of my internship at the newspaper and I wish it never ended. Cheer me up, please?! Happiness inducing today: Finishing the post on my birthday I’ll obviously go with the birthday wishes again <3! Blogger birthday calendar: Good idea? Bad idea? Unless you want to keep it a secret: Tell me your birth date and expect congrats coming your way on your special day :)! Do you agree there’s a certain way to load dishwashers? Possible answers are: yes or heck, yes! Any favourite chick lit books? It’s What I ate Wednesday! But not just any old Wednesday … it’s my birthday! So while you’re reading this I’m either sleeping, cooking my birthday lunch because I get to eat lunch with my family for once today or elsewise just relaxing. We actually don’t have a lot planned but simply plan on having an awesome day. And thinking about it: what better day for a [mid-week] birthday than the [blog] world’s biggest [food] party? Clearly not any old day of the week. Thanks for hosting my birthday party WIAW, Jenn! Seeing as my birthday’s just today this week’s What I ate Wednesday is all about what I ate pre-birthday. Speaking of comfort food I can’t deny the phyllo pastry obsession is still going strong. Rather than considering me stuck in a food rut which I am I’d go with taste-testing the recipe to perfection. Just to make sure that if somebody decides on trying it [which I obviously suggest :)] it’ll turn out a hit. Selfless blogger dedication, don’t you think ;)? And this time I even went with the kidney beans listed in the recipe again. I’d be curious to know if any of you noticed the mismatched pictures in my recipe post showing the chickpea variation … Clearly a lesson learned in paying attention when posting. But it’s delicious either way. It might not have been my birthday on the weekend yet but my favourite dessert – ice-cream [or the healthified version of it] – still had to feature. Our dear Fairy Broccoli Mother came up with this creamy and colourful creation that is simply perfect. While I don’t count macros anymore some of you might be happy to hear that this wicked delicious ice cream packs in a protein punch, too. And either way a little bit of protein won’t hurt anybody. Before ending it here I want to say once more how much your understanding and kind comments on my last post meant to me. It was another one of those I hesitated publishing but it’s good to know I’m not alone. Thank you! With that I’m off to and wishing you a happy Wednesday! Eat some extra delicious food to celebrate me today ;). Kidding. Sort of. Happiness inducing today: My progress on the puzzle. Do you eat differently on weekday birthdays than on normal days? What’s your favourite birthday dessert? I’m not a fan of [regular] cakes anymore but I do have plans of preparing a special belated birthday dessert on the weekend. Like I’ve mentioned before my internet access or the time I get to use it has been cut down majorly since moving back in with my parents. No access at work and a restricted time at home haven’t allowed me as much time to blog as I used to have. Nonetheless, blogging has become an integral part of my life I don’t want to miss anymore. The friendships, the support, the inspiration … it’s marvelous. Just ask my mum how excited I get about meeting blends, connecting with all of you online, taking pictures and writing posts :D. By now my whole family has understood that blogging is way more than just another hobby to me. But then it deemed to me: Do I stop reading a blog just because the blogger alternates the days they blog on or doesn’t find the time to comment on my blog as regularly anymore? No. If I like the way they write I will come back no matter what just because I can relate to them, we have things in common, share an opinion on a topic, … Looking at my [non-]resolutions again helped to ease my mind, too: Just live. Life is everchanging. We can’t predict what the circumstances on any day[s] of our lives will look like. Especially talking to some blends and excusing for my lack of commenting on their blogs lately made me realize that nobody is mad at me for taking some more time to repy to mails or not comment on their blog because I haven’t found the time. It’s just me setting those expectations [and wanting to comment and let you know I’m reading because I still do]. So what is this post all about? It’s about a realization I made to relax. Maybe some of you can relate and if not I hope you don’t mind my rambly explanation. So in case I’ve been reading and commenting on your blog regularly before and haven’t lately: please know that I’m still reading. And you’d better believe I’ll be back once I get full internet permission [yes, it feels a little weird to talk about it] again 🙂 . Happiness inducing today: Starting my day with a great relaxing workout at the gym. 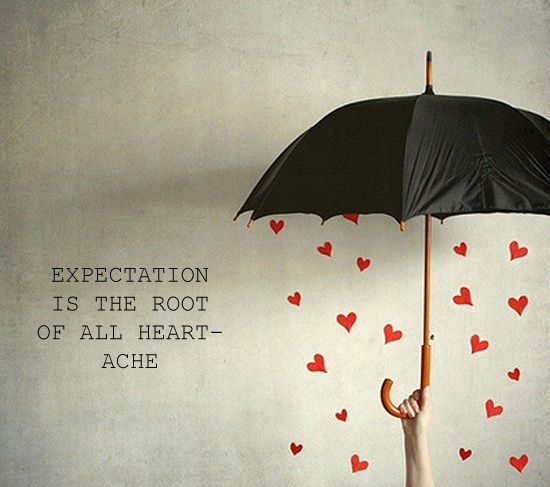 Have you ever struggled with trying to fulfill expectations that [you assumed] others had? Bloggers: Do you feel obliged to stick to a certain schedule with your posts [i.e. : days to post on, a certain number of recipe posts, …] or did you do in the past? How do you manage your blogging time in terms of writing posts and commenting? I’d appreciate any advice because I’m sure there’s a better way of time management. Broken record or not: I can’t believe it’s already Sunday again! Does 2014 somehow have every intention of beating a record by presenting us the fastest January in years? Maybe it’s just a personal sensibility knowing that the end of January means my internship will be over which isn’t exactly reason to rejoice for me. But here’s to keeping up with my motto to just live and let things fall into place. There’s still a week left with a number of projects lined up and that alone is inspiration to keep up the positivity. No matter how fast the weeks fly by, though, not a single one passes without many great and inspiring posts. As usual let me know which ones you enjoyed, too. ‘Fit’ is a flexible term different for each and everyone of us. Have you found your ‘fit’? 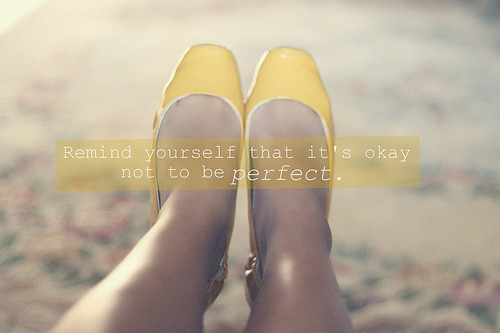 We don’t need to be perfect to at everything. Great tips on what to keep in mind when struggling with self-doubt. Time to stop thinking in physical ‘flaws’ and start measuring by inner beauty. Thought-provoking post on the social stigma of disabilities. Changes don’t have to be drastic to make a difference – just little things you can easily do in everyday life. “Eat anything you want, just cook it yourself.” – Way to change how we look at and appreciate food. Short, simple, spot on: the basic outlines of a balanced diet. Don’t feat the roots! Great information on how to choose, store and prepare a variety of season’s best as well as their health benefits. Some familiar faces, some new [to me] bloggers to pay a visit. The blessings and banes of turning of your home doubling as your office. Interesting read even for those who don’t work from home [yet]. If – like me – you’ve pondered to get into scrapbooking but never knew where to start. A great DIY alternative to store-bought chapsticks without sketchy ingredients. A beautifully arranged bowl of all things delicious and nutritious. Combining two of my favourite [savoury bread pudding & mushrooms for meatiness] this has to happen soon! Apple Crisp itself is awesome. Add salted (!) caramel to the equation, turn it into a single-serving recipe – I’m sold! Nutritious oats make this banana bread a perfectly acceptable way to get in some [more] Nutella at breakfast. Happiness inducing today: Having an all-around cozy happy day with some food for thought through an interview for the newspaper. If you read any of the above already I’d be curious to hear your thoughts! What a difference a label makes … Not in terms of diets in case that’s what you were thinking. But if you’ve been reading my blog for a while already you might remember I used to do these ‘random thought’ style posts for a while already. But while they were fun to write I can’t remember I ever got as excited about them as I do now for Thinking out loud. So thank you for the music label, Amanda! 1. Speaking of labels and now in terms of food after all: Why is it that children [or grown-ups, too, if we’re being honest] enjoy eating one and the same dish or food even more when it comes with a cute label? Going through some of my stuff still stored in my old room at my parents’ I happened upon this gem of a book called “Party recipes for Children”. [Note that even if you don’t speak/read German the Amazon preview has some hilariously old-fashioned pictures to look at.]. Who wouldn’t want to eat Anti-Vampire Soup, Pizza faces or Little Red Riding Hood Salad?! I know you’re curious about the recipes now ;). 2. Why not start a random post with a random picture I took in Berlin? This was too cute to pass. 3. Not looking my age can be a real annoyance when working as a journalist[-to-be]. Sounding young on the telephone doesn’t make things any easier, either. Case in point was one member of a network I was supposed to write an article about deeming it necessary to spell ‘coordinator’ to me. Eh … thank you very much for nothing. And no, I’m not the newspaper’s school intern. 4. Granted, judging from my current [work] notebook you might doubt my age. In my defense, though, I didn’t buy and choose it myself but just asked my mum if she had a spare one lying around. Very grown up, no?! It happens to actually be one I got years back, though, and had never used so it went directly into my mum’s stash. 5. When I returned home on Sunday one of the first things my dad asked about my meet-up with Lucie was if she was vegan. Picture his delighted grin when I told him she wasn’t. “So not everyone’s vegan then, huh?” Trust me, I never said anything like that. Oh, sure, just so you know: all bloggers are obviously vegan – even if you didn’t know yet you’d better start chugging soy milk and dousing every meal in nutritional yeast right now to fit the stereotype. 6 . Judging from that graphic I’ve failed at fitting the blogger stereotype all the way. Or wait, let’s see … Does Journalism count as a form of art? Check. Loves: photography, blogging, family, fashion, obscure [is vegan and organic obscure?] restaurant, … Wow, I’m apparently more stereotypical than I thought. Should I be proud or ashamed? … because I kept sporting it on my cardigan all day long and didn’t notice until back at home. Woops. Lucie, did you notice? No need to shell out money for brooches or buttons when you can get a bright spark on your clothes for free ;). 8. Sorry I’m not sorry for the constant Disney appearances on the blog. But after Caitlin tweeted her result of this test yesterday I just had to try it and share with you, too. Don’t forget to tell me your result because you know I’m curious! Happiness inducing today: A kind* stranger at the gym telling me to enjoy my workout and sounding like she meant it. Not something you – or at least I – hear often because far too many people don’t even greet others. * that’s why I thought the ‘random act of kindness’ graphic was the best fit for the birthday week picture. 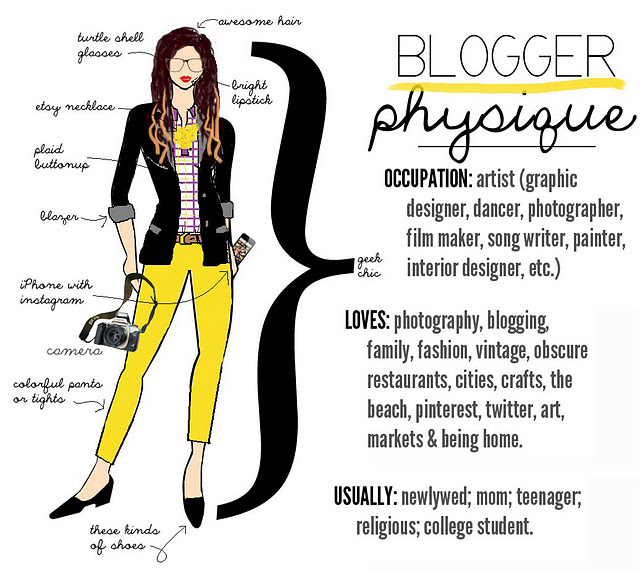 What makes you the stereotypical blogger [according to others]? Do you jaywalk often or are you a goodie-goodie using the cross-walk?